Orion, bass player for the respected Polish metal band Behemoth, is the designer of his new LTD Signature Series bass, the Orion-5. 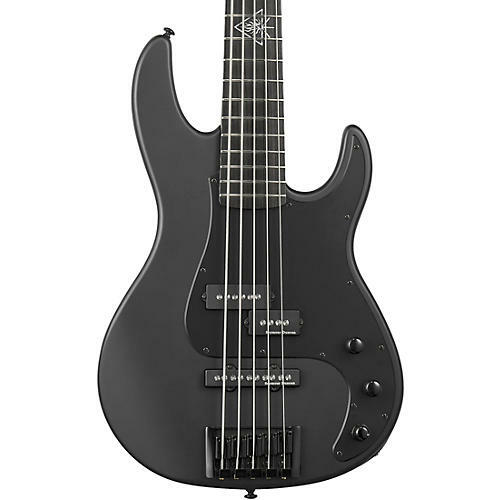 A five-string model with a traditional shape based on our AP Series, this bass adds the contemporary look, feel, and sound needed for high-energy music. It employs a comfortable alder body with a bolt-on maple neck at 34” scale, with an ebony fingerboard that features glow-in-the-dark side markers and the Behemoth “Trinity” logo over the 12th fret. The Orion-5’s heavy sound comes from a set of Seymour Duncan Quarter Pounder PJ pickups, and includes a Seymour Duncan Blackouts 2-Band Stacked Preamp w/ Switchable Treble Frequency. Finished in Black Satin, it includes a matching pickguard.